Railpictures.ca - Mike Danneman Photo: The moon sets over the Canadian Rockies at sunrise on September 22, 2002, at the Royal Canadian Pacific excursion train heads eastbound at Lundbreck, Alberta. | Railpictures.ca – Canadian Railway Photography – photographie ferroviaire Canadienne. 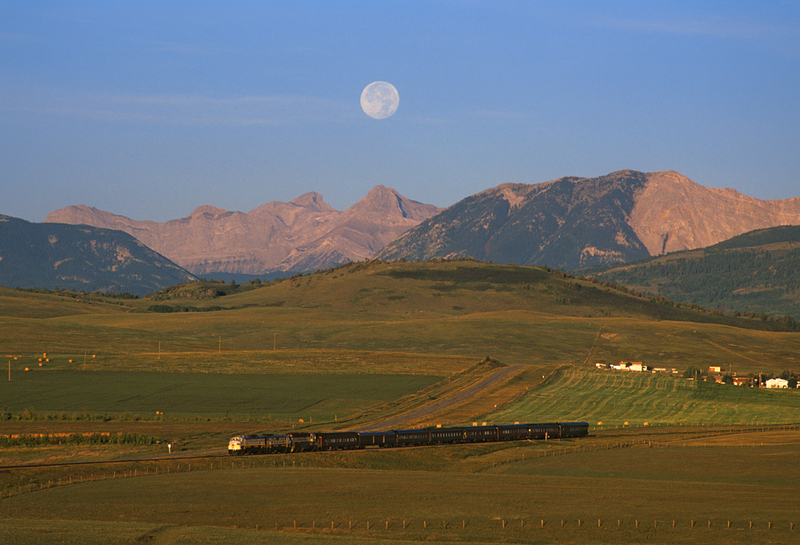 Caption: The moon sets over the Canadian Rockies at sunrise on September 22, 2002, at the Royal Canadian Pacific excursion train heads eastbound at Lundbreck, Alberta. Here’s an old guy’s question: do folks still buy books, especially big coffee table books? If so – enough to make publishing one worth while – imagine a book entitled “Scene in Canada” with pictures like the one here. I’d buy it. If I were to list the ten best shots here at Railpictures.ca, this would be included. I totally LOVE this picture! This is so amazing! Very great shot!